The percentage of obligor's income formula is a flat portion of the non-custodial parent's net pay. If you and your spouse have one child, it's 20 percent. If you have three children, it increases to 32 percent. The percentage continues to graduate with the number of children you must support, topping out at half your net income – 50 percent – if you have six children or more. Illinois law allows your spouse to serve a notice to withhold income for support on your employer, and this obligates your employer to deduct your child support obligation from your paychecks and send the money to the state's support disbursement unit. This unit will then issue payment to your spouse. The support percentage is not based on your total earnings. Certain deductions are made first, and the percentage applies to what's left. 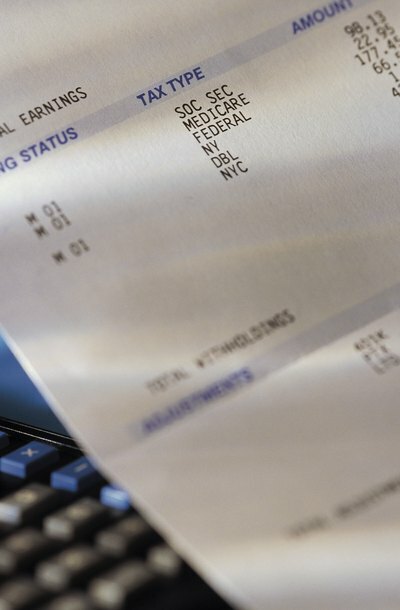 Most of these deductions are for things you can't avoid paying, such as federal and state income tax withholdings, FICA deductions, and payments toward a retirement plan if contributing is a condition of your employment. Union dues are also deductible, because you generally can't work in your field without paying them. If the court orders you to pay for life insurance as part of your divorce, you can deduct these premiums. If you were already paying child support for other children before you married your current spouse, and if this child support order is still ongoing, you can deduct this obligation as well. Child support covers your children's most basic needs – food, clothing and shelter. An Illinois court can tack on extra payments to your minimum support obligation to address other expenses. For example, if your daughter is a Girl Scout and regularly went to camp every summer during your marriage, the judge can require that you pay a portion of this expense in addition to your child support obligation so she can continue attending. Most add-ons relate to education, health care needs and work-related child care, however. If your spouse is paying for these things, you might have to contribute a portion. If you're already paying for them, you can deduct these costs from your gross income to determine your net income for child support purposes. Under Illinois law, child support for each child is payable until she turns 18 or graduates high school, whichever occurs last. If your child turns 18 in May and graduates from high school in June, your support obligation to her ends in June. If she graduates in June, and turns 18 in July, your support obligation ends in July, at her 18th birthday. Under no circumstances does it continue past her 19th birthday, even if she hasn't yet graduated from high school. Illinois requires that a termination date be included in your divorce decree. As each child emancipates and moves beyond the need for your support, your obligation is adjusted to reflect a percentage for one less child. Illinois Legal Aid: Can an Employer be Fined for Not Withholding Child Support From an Employee's Pay?